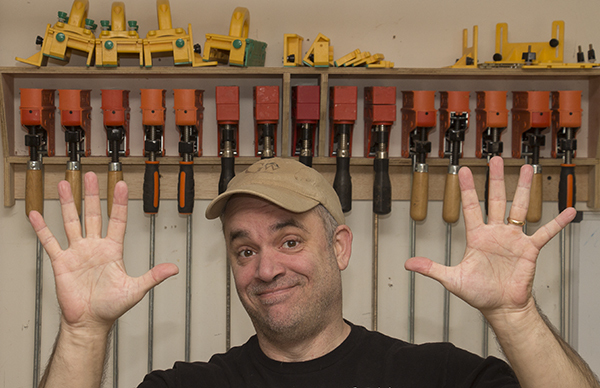 Ten years ago today (January 24, 2006), GarageWoodworks.com was born. The website has gone through a lot of changes over the years as I continued to try new things and learn HTML and PHP in the process. I write the code for and maintain my own website which I feel gives me a lot of freedom and control to do what I want and when I want. A few years after the website started I began publishing videos (videos started in 2009) which have taken on a life of their own! The only support that I’ve received over the 10 years has been from woodworkers like you and a few sponsors. Garage Woodworks has always been Google Ad free. This entry was posted on Sunday, January 24th, 2016 at 1:43 pm	and is filed under podcasting, website. You can follow any responses to this entry through the RSS 2.0 feed. You can skip to the end and leave a response. Pinging is currently not allowed. I’ve been a follower for a long time and have to say I’ve picked up a thing or two along the way. Let’s celebrate with a caliper based video !! Here’s to another 10 brother. I appreciate you sticking with me over the years! I very much appreciate all the work you put into publishing your work and tips online. I’ve made a couple of the jigs you showed and use them regularly. Keep up the good work and good to see you’ve got all your fingers left to show 10!! Congratulations! I’ve been following for about the last four or five and find a lot of great information in your videos. oh, and man do you have a lot of grippers! I thought I was stocked when I had two!